Family Week Kids Go Free! 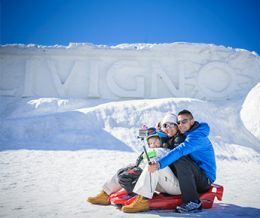 Do not miss the opportunity to stay one week in Livigno with your family, choose, Family Week Kids Go Free, synonim about fun and saving!! If you book your stay in one of the following week: - From 25th January to the 1st February 2020 and from the 28th March to the 04th April 2020. The first child up to 12 years , accompanied by two paying adults will get the full gratuity on hotels , while the second child up to 12 years , always accompanied by two paying adults , will get a discounts of 50% on the rate reserved for them . Free Skipass will be given to a kid under 12 years accompanied by a paying adult. Skipass will be given if the adult pays a Skipass - min 6 days,for the same duration (6 days = 6 free days for the kid). Do not miss this opportunity , we are waiting for you!